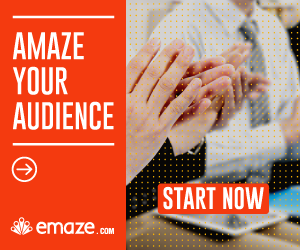 want more people to see your Emaze presentations ? then upload them to Youtube ! in this article, you will learn why it’s important to upload your presentation to youtube in order to get a huge exposure and how to turn your Emaze presentations into attractive youtube videos. In most cases you want your presentation to get in front many people in order to promote your business or your ideas. if your presentation is not personal you want to set your presentation in the most popular platforms in order to get a big exposure. Why to upload your presentation to Youtube ? with all the respect to the wonderful online presentation maker of Emaze, if you want that many people will see your presentations, you must upload them to big video sites like youtube. you can download your presentation in variety format. but in order to upload it to youtube, you must download it as a video. you can see here full guide (and video) of how to download Emaze presentations. Description– blow the video write long description about your video. Tags– add tags with keywords related to the video. Youtube allows you to add easily music to your video. you can choose a music from an impressive library. Share your Youtube video with the world ! in order to give the first boost to your video, share is with your friend on social networks like Twitter and Facebook, and ask them to share your video.